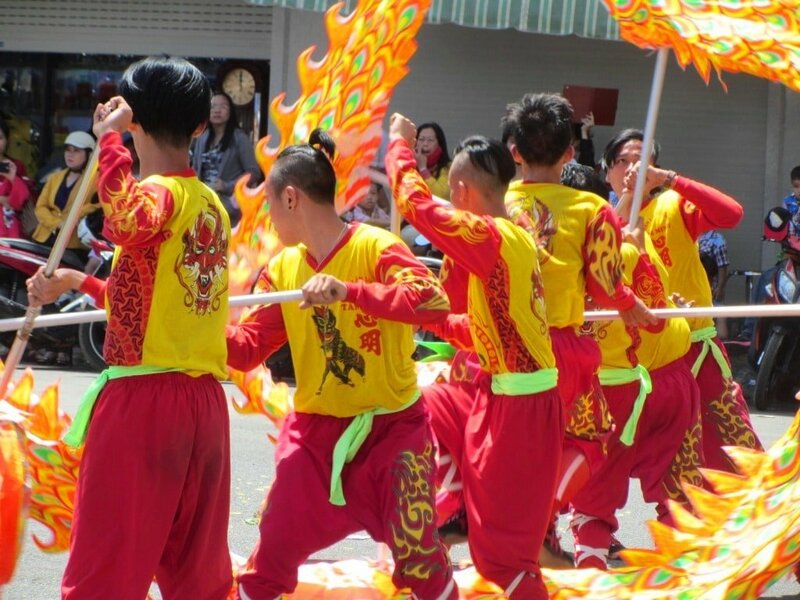 In a country that loves a celebration, Tết (Lunar New Year) is the biggest bash of them all in Vietnam. Sounds like fun – and it is fun – but it’s not necessarily great news for travellers. In the weeks leading up to Lunar New Year, transportation is at breaking point, as millions of Vietnamese head back to their quê hương (home town) to be with their families. And, as soon as the formalities of New Year’s Day are over, the entire nation hits the road, travelling to all corners of the country for a week’s holiday. Accommodation is packed, prices are sky-high, litter is a big problem, and the roads are busy and dangerous. 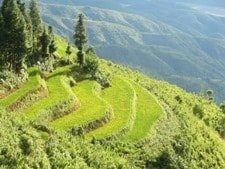 I love Tết and all the buzz that surrounds it, but, in recent years, I have chosen a quieter option: a meandering road trip on quiet roads, bypassing popular tourist spots, staying in small guesthouses, camping in the open, and riding through big, empty landscapes, basking in the glory of the southern dry season. I call it The Tết Classic. As most people have at least one week of vacation during Tết, I’ve written this guide as a 7 day road trip, according to how I would personally choose to spend the Tết week. I’ve written a description of each day on the road, including recommendations for food and accommodation, and links to my other posts for more detailed information on specific areas. The average daily distance is a leisurely 150km, but of course you can easily modify this route to make the days shorter or longer. The whole point of this route is to steer clear of the crowds: although this road trip passes through some popular tourist spots, they are not intended as destinations. Note: roads are especially dangerous during Lunar New Year – drunk and reckless driving is extremely common, making Tết by far the deadliest month of the year on Vietnam’s roads. This route stays off busy highways as much as possible, but you should still be very cautious, even on small back-roads. Leaving Saigon early in the morning (I mean really early, like 5am, in order to avoid traffic and police, who are out in full force just before Tết), glide down to the Cat Lai Docks and catch the ferry across the broad sweep of the Dong Nai River. This is the ‘Back Road‘ out of Saigon, and it can be quite lovely in the mild chill of a dry season dawn, with the mist lifting off the river, and the container ships carving their paths through the black water. After stopping in the unexpectedly clean and appealing town of Ba Ria for a bowl of breakfast noodles, it’s time to turn off the highways and head down to the Ocean Road. The first blast of salty air and the first glimpse of the East Sea near Loc An, is when you realize that you’re now far from Saigon, and that your Tết road trip has finally begun. The 80km coastal stretch – through the beach communities of Ho Tram, Ho Coc and Binh Chau – to Lagi is an exhilarating ride past windswept sand dunes, old forests, and wild beaches baking under the southern sun. Veering inland through eucalyptus and cashew plantations, Road 55 drops steeply into the fishing town of Lagi. Small but busy and bristling with energy, Lagi is a likable place with a gigantic fleet of blue fishing boats, and a good beach just out of town. For a quiet night by the beach head to Ba That Resort or the cheaper options surrounding it. For dinner there’s plenty of good street food in Lagi during the evenings. Breakfast in Lagi is a treat at Quán Minh Ký (361 Nguyen Truong To Street): their bò kho (aromatic beef stew) is well worth waking up for. 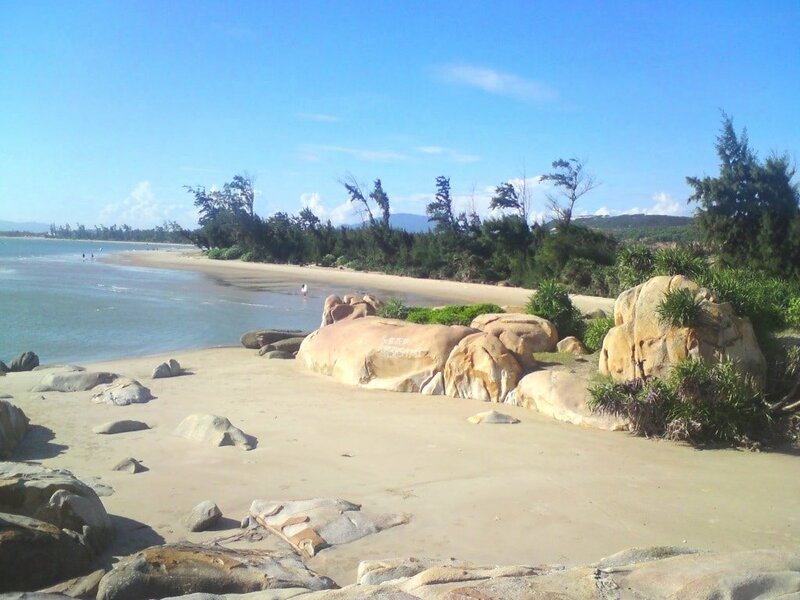 After a morning swim in the ocean, turn your back on the coast and head north from Lagi on Road 55. The arid, rugged landscape in these parts is reminiscent of southern Spain: I half expect to see the ruins of a medieval Crusader castle, perched atop a rocky cliff. 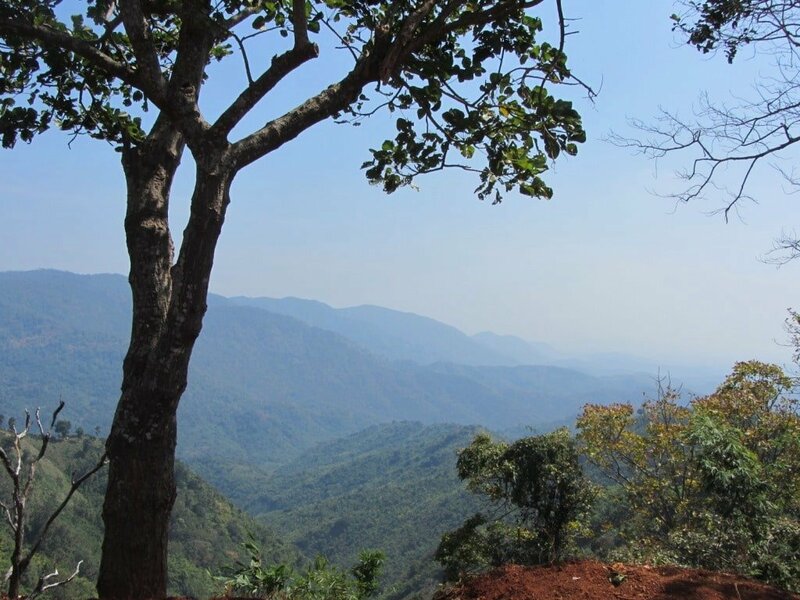 After crossing the dreaded Highway 1, Road 55 bears northeast, starting its meandering ascent from flat farmland to the coffee and tea plantations of the Central Highlands. As the road climbs towards Bao Loc, the salty, sandy, fishy tang that pervaded the air in Lagi, is replaced by the earthy, flowery, smokey tones of Vietnam’s highlands. At Bao Loc, turn right (due east) onto Highway 20. There’s hardly a tree left standing on the 30km stretch from Bao Loc to Di Linh, such is the intensity of tea and coffee farming in this area. The oddly named Bo Bla Waterfall makes a pretty stop before arriving in the unassuming town of Di Linh, at an elevation of around 3,000ft. While both Bao Loc and Di Linh have plenty of decent nhà nghỉ (local guesthouses) for the night, there’s a far better option if you turn right (due south) onto Road 28 at Di Linh (signposted to Phan Thiet). A few kilometres along Road 28 you’ll find Juliet’s Villa Resort. Several simple bungalows are spread around colourful gardens – they even have a waterfall in their backyard. It’s a peaceful and very attractive place to stay. 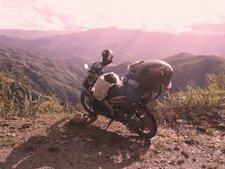 Continuing south on Road 28 from Juliet’s Villa Resort, the route climbs into dense jungle as it crawls up and over the Di Linh Plateau. From the dusty, red-dirt streets of Gia Bac village, there are grand views over the blue foothills of the Central Highlands, down into the plains and, in the far distance, the East Sea. The road narrows as it curls down the mountain, folding back on itself a dozen times, before leveling out and passing through acres of rice fields. 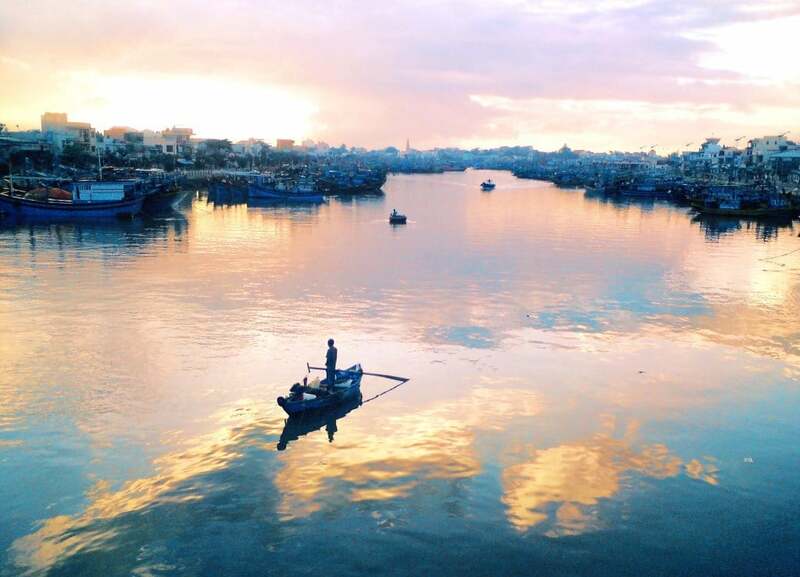 Phan Thiet is a great place for lunch and a quick stroll along the riverfront, where hundreds of fishing boats jostle for space. 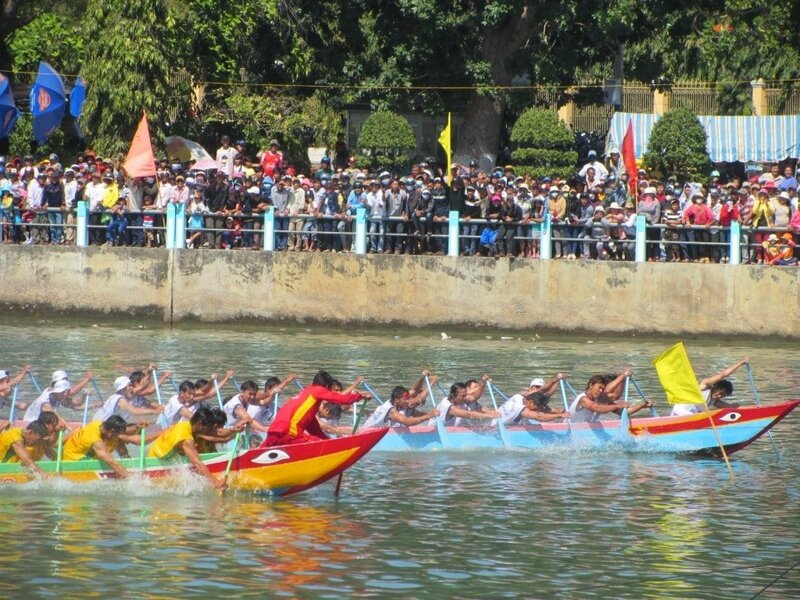 If you’re lucky, your visit will coincide with the Tết boat races on the Ca Ty River. Races are run in many different categories according to the vessel used – from longboats to coracles. A large crowd lines the river banks, cheering on the participants. 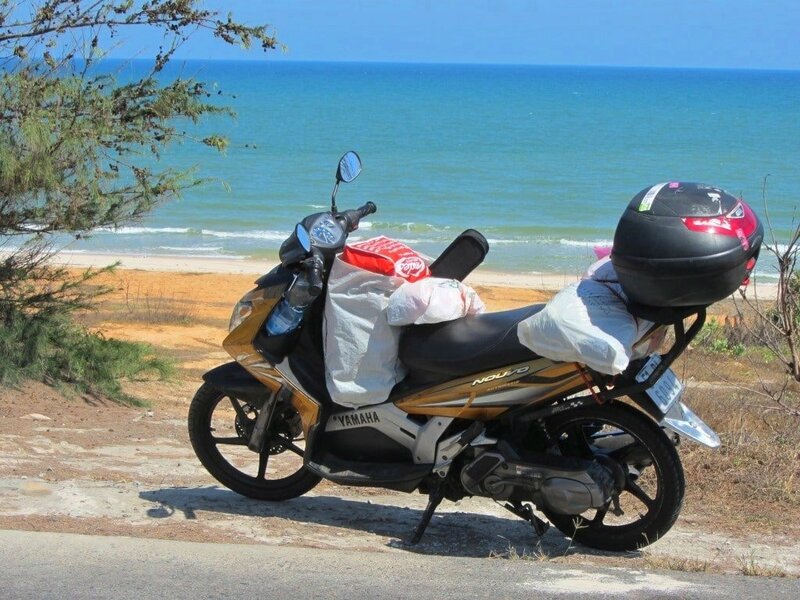 However, as much as I love Phan Thiet, accommodation can be busy and pricey during Tết, so I choose to ride east, beyond the resort-clogged sands of Mui Ne and out the other side to Long Son Campgrounds. With lots of space, a large beachfront, watersports, different camping options, and cheap food and drink, this is quite possibly the best campgrounds on the southern coast. Pitch your tent, sit back with a gin and tonic ($1) and watch the stars rise over the ocean. Rise early because today is a long but exceptionally beautiful ride along excellent new coast roads. Exiting Long Son Campgrounds, the road hugs the coast along 5 kilometres of empty sands, where cows roam in the surf and fishermen throw their lines. After a sharp rise through a vast cassava plantation, take a right (due east) onto the brand new White Sand Dune Highway. The dunes rise to your left and continue in the form of smaller drifts of white sand all the way to the fishing town of Phan Ri Cua. 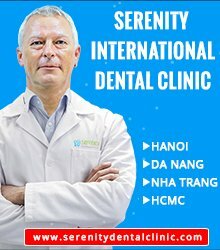 If you’re short on time, Lien Huong has a good guesthouse called Nhà Nghỉ Hương Nam (062 3851 286) on Vo Thi Sau Street. Otherwise, continue heading northeast, by joining the heated tarmac of Highway 1, for a brief spell of 25km to Ca Na. The Ca Na Hotel (068 3760 922) has decent rooms right on the beach, but if you’ve got time, keep going because the best is yet to come. A right turn (due east) at Ca Na fishing port leads to an ambitious new road that has only recently opened. After passing mountains of freshly harvested sea salt, the new road climbs around the boulder-strewn promontory of Mui Dinh. 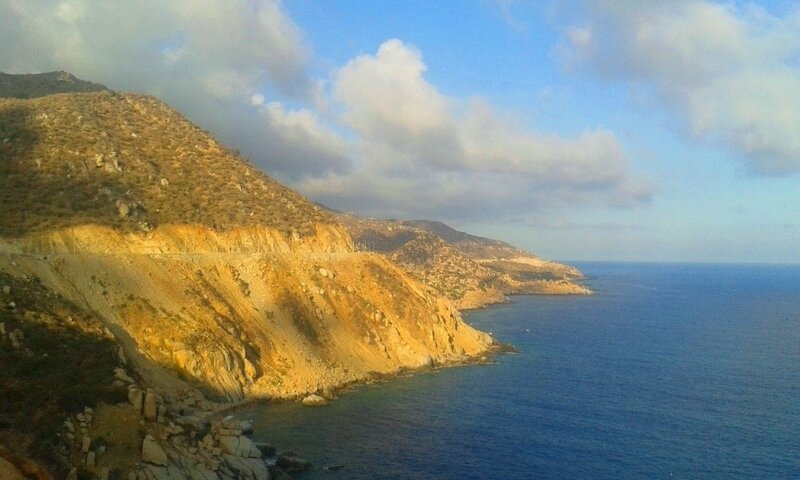 There’s a stark beauty to this area, characterized by large rocks, cacti, deep blue seas and blue skies. At the end of the Mui Dinh road, a new bridge crosses the Cai River and onto the arcing beach of Ninh Chu Bay. Vastly underrated by travellers, Ninh Chu is essentially Phan Rang’s beach. It’s big, quiet and beautiful. A particularly nice place to stay is Bau Truc Resort for those on a mid-range budget. For a cheaper option, the camping and food at Ninh Chu Bay Beach Club is fantastic value. 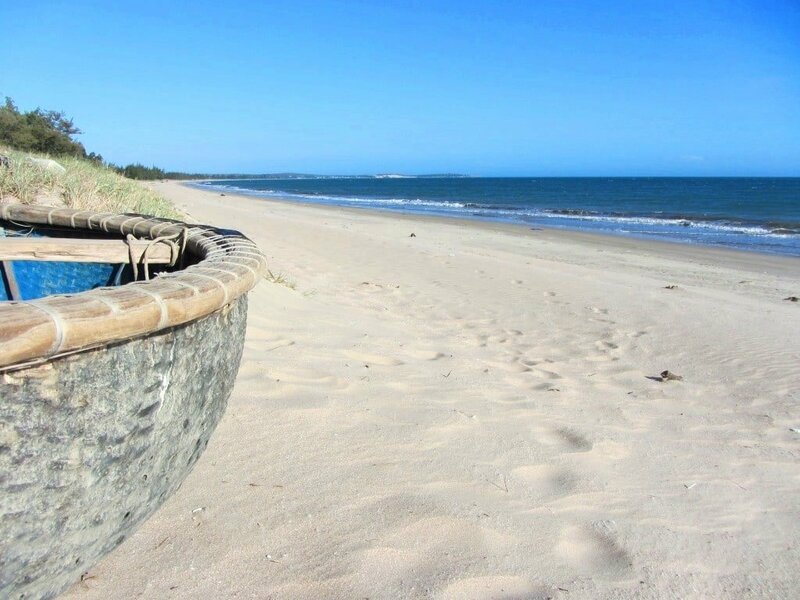 However, if time allows, continue east from Ninh Chu Beach towards Vinh Hy Bay. This is yet another stunning new coast road around a mountainous promontory. 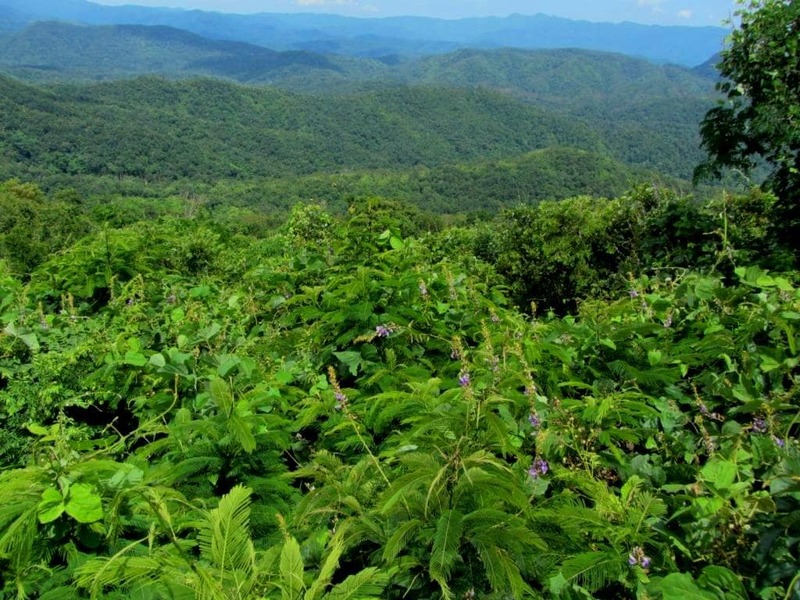 The mountains here are densely forested and belong to the Nui Chua National Park – black Asian bears still roam the forests here. After 25km of winding tarmac through wooded hillsides, the road drops into a perfect little cove, hemmed in by high hills, with a small fishing fleet in the middle. This is Vinh Hy Bay. It’s a magical location and there’s good-value accommodation right in the middle of it at Vinh Hy Resort. They also serve good food here, which you can eat on the terrace, next to the pool, overlooking the harbour. After breakfast, watching the sun rise over the bay, it’s time to continue north on the coast road. Snaking up a steep hill behind Vinh Hy Bay, the road skates along the top of a ridge before plunging down the other side to Cam Ranh Bay. The views over beaches and islands dotted in the bay are fantastic. When the road hits sea-level again, there are dozens of empty stretches of white sand to stop and enjoy the surf. At the northernmost tip of this promontory, a finger of land points into the bay, this is Cam Lap Promontory. 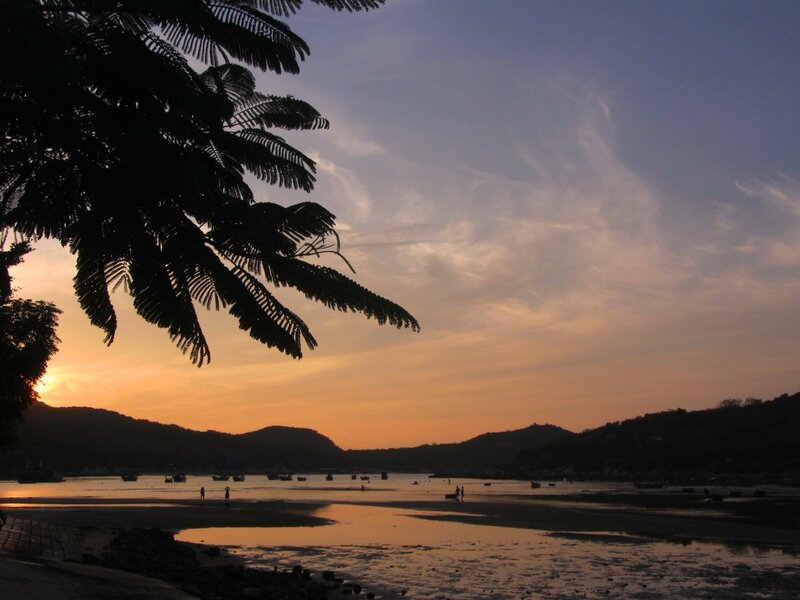 Covered in mango trees, ringed with powdery beaches, and with views over the serene waters of Cam Ranh Bay, this is a wonderful place to camp. When the coast road meets Highway 1, turn right (due north) for a few kilometres before taking a left (due west) onto Road 27B. I call this The Burnt Road because it passes through one of the driest areas in Vietnam. With dried-up lakes, thirsty trees standing on cracked earth, arid mountains and a wild west feel, this is Vietnam’s desert. Under the relentless sun of the dry season, it’s a desolate but fascinating 50km ride. Not long before the road joins Highway 27 towards Dalat, it crosses a couple of very inviting clear rivers. With a bit of searching, it’s possible to find a nice camping spot on a secluded river bank for a night in the wild. Turning right (due northwest) at Tan Son, the road meets the mountains once again. The newly resurfaced Ngoan Muc Pass is now in excellent condition as it winds up the mountains in a series of majestic twists and turns. The views down over the arid plains and foothills of the Central Highlands are marvellous. 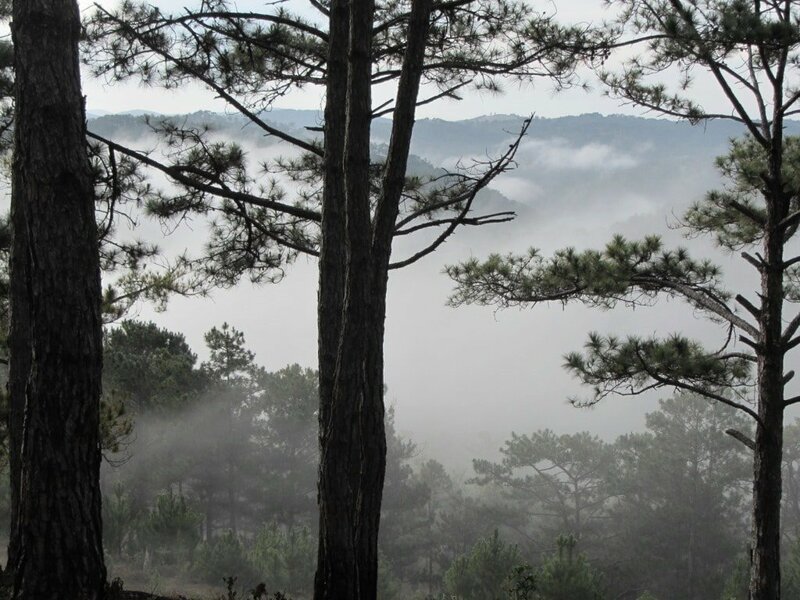 Once at the top of the pass, all the smells of the highlands – coffee blossom, wood smoke, pine trees – come flooding back. The road surface deteriorates slightly, but it’s a steady and pretty climb all the way to Dalat. This mountain city is one of the most popular destinations during Tết holiday – even in a city that’s full of hotels, it can be hard to find a room here. Instead, I choose to make a brief stop in Dalat for a coffee and a meal, before continuing half an hour north of town to Hồ Suối Vàng Lake. This lake is surrounded by pine forests which are perfect for camping. The dry season weather is ideal for a night under the stars. But come prepared because, at an elevation of over 5,000ft, temperatures at night in January can reach as low as 7°C. The early morning is chilly in the pine forests, so it’s a good idea to pack up your tent and start heading downhill to some warmer weather. Make a quick stop in Dalat for a nice warming breakfast, then start the long descent back to sea-level, beginning with the Prenn Pass. Winding through pine forests with a few abandoned (and apparently haunted) French colonial villas lining the road, this is a pretty pass, but it can be treacherously busy during Tết, so take care. At the bottom of the pass, the temperature is already beginning to rise, as Highway 20 ploughs through rather cluttered farmland to Ninh Gia. Blink and you’ll miss it, Ninh Gia is a small village on the highway, and this is where you turn left (due south) for the small mountain road down to Mui Ne. 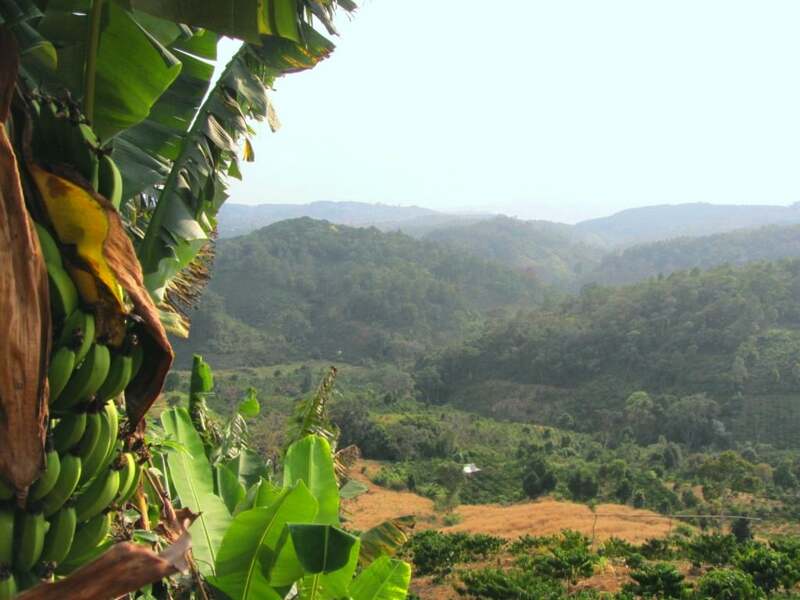 It’s a nice route (although a bit battered in parts) through fruit plantations and cash crops, such as tea, coffee, mulberry, and banana. If you’ve got time, make a small detour to Bao Dai Waterfall. Just before the final descent to the plains, there’s a superb vista down towards the East Sea, from where you can see the road meandering down the mountains like a varicose vein on the landscape. After join Highway 1 at Luong Son for a couple hundred metres, turn left (due south) towards Mui Ne. 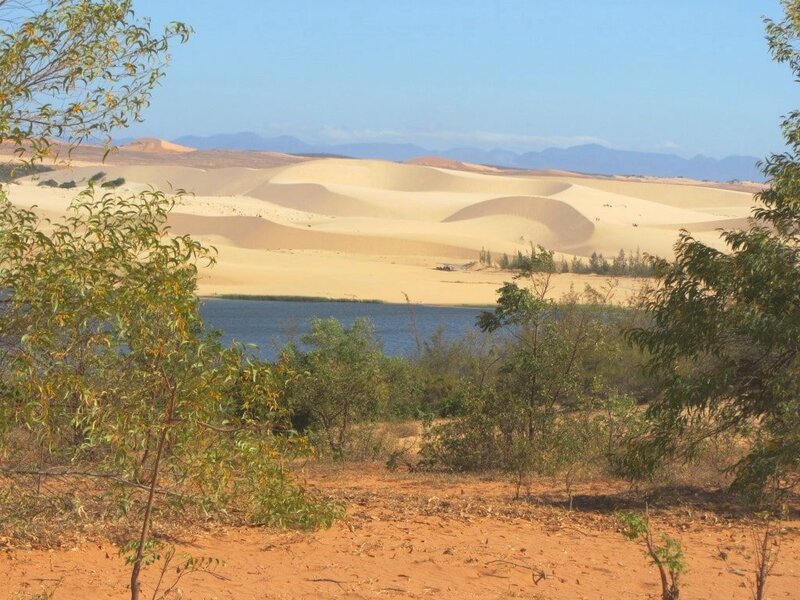 This takes you back past the White Sand Dunes and back along the coast road to Mui Ne. As accommodation is difficult to find on Mui Ne beach during the holidays, I prefer to continue on to Phan Thiet and find a local guesthouse near the municipal beach there. There are lots of nhả nghỉ (guesthouses) on Le Loi Street, just to the west of the beach. 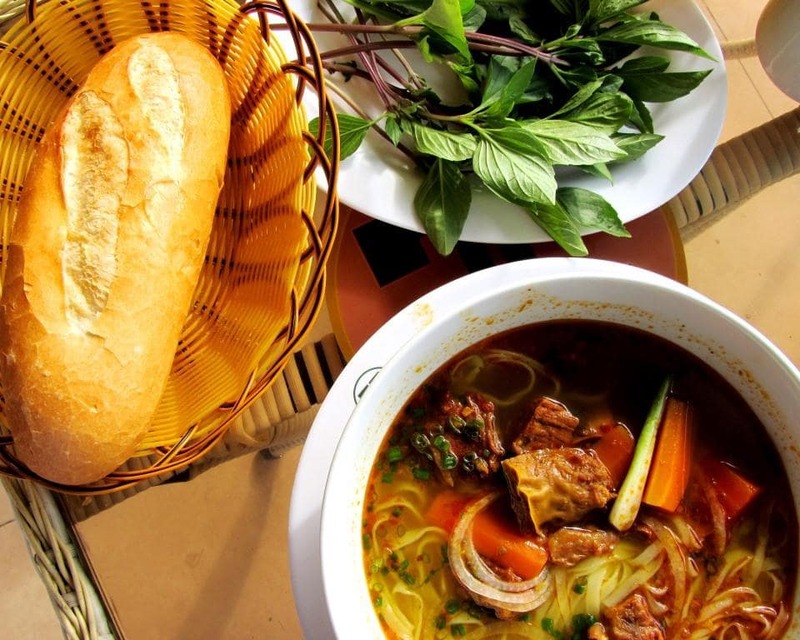 One of the best things about a night in Phan Thiet is the food. 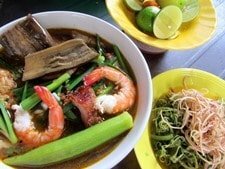 For a seafood feast and a raucous ambience, check out the restaurants lining the harbourfront on Pham Van Dong Street, particularly Quán Hải Sản Thuận Phát. The final leg is a long but peaceful ride along the Ocean Road from Phan Thiet all the way back to Saigon. If you have time, you could easily spend several days beach hopping on this road. Leaving the bustle of Phan Thiet behind, head southwest along a great stretch of coast to the lighthouse at Ke Ga. Built in 1899, when Vietnam was under French colonial rule, this was one of first (or possibly the first) lighthouse in the country. It’s an impressive, sturdy structure with panoramic views from the top. The lighthouse is on an islet just off the coast. At low tide you can wade out to it, alternatively you can arrange a boat from one of the cafes at Ke Ga hamlet. The road heads inland until Lagi – which makes a convenient lunch stop – from where it’s just a matter of retracing your steps from Day 1, but in the opposite direction. I like to take the ride from Lagi to Ba Ria very slowly, soaking up as much of the light, space and salty air as I can, before hitting Highway 51 back into the pollution, noise, and humidity of Saigon. 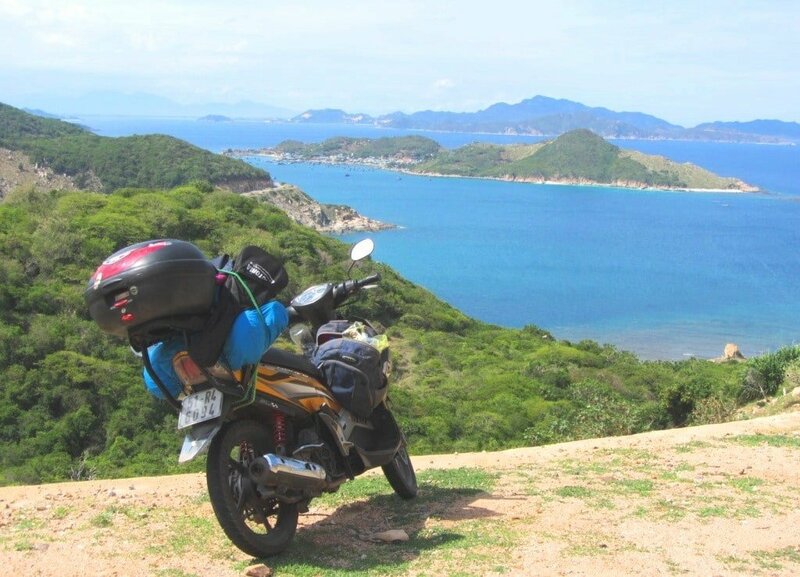 This entry was posted in ALL, Coastal, MOTORBIKE GUIDES, Mountains, The South and tagged blog, Cam Ranh, Dalat, guide, motorbike, Mui Ne, New Year, road trip, Tet, travel, Vietnam. Bookmark the permalink. I don’t have a tent. Is it still feasible to do this loop without camping? What is the biggest difference between this loop and the Southeast Loop. Would the Southeast Loop also be okay during Tet? The biggest difference is that the beaches north of Mui Ne and the mountains north of Dalat/Mui Ne are bigger and better than those to the south. But which you choose depends mostly on your time frame. The Southeast Loop is shorter than the Tet Classic. There are plenty of mini-hotels and local guest houses (nha nghi) on these routes in the cities, towns and villages. The roads on the Southeast Loop will probably be busier than on the Tet Classic. In general, on both loops you should expect the towns and cities to be busier during the Tet holidays – that’s one of the reasons I try to camp as much as possible. Amazing guides! I am planning a trip during Tet, but wondering if at all during the holiday if you came across any mechanics open on this route. I assume you do your own repairs but I will be renting and I am relatively inexperienced with motorcycle repairs and oil changes. Actually, I’m a useless mechanic 🙂 But fortunately, in Vietnam you’re never too far from someone who can fix your bike, even during Tet. The Vietnamese word for bike mechanic is sữa xe. I am planning to do the Phu Quoc loop leaving HCM on the 15th very early morning, sleep one night at Chao Doc and next night at Ha Tien before taking the ferry to the island. On the Tet (16th) I will be travalling to Ha Tien. Do you think I would have problems because of the Holidays? Eg. the roads too dangerous? No, I don’t think you’ll have too much problem on the road to Ha Tien, but you might find the boats to Phu Quoc are very busy, and the island itself will be pretty crowded during the holiday. Take care on the roads anyway – Tet is by far the deadliest time of year on Vietnam’s roads. We are hooked to your website, so many good information 🙂 We are currently doing the big one on motorbikes and got two weeks left. Coming from Hanoi going to Saigon. Yes, it will likely be very busy between Feb 16-24 at most of the campsites. 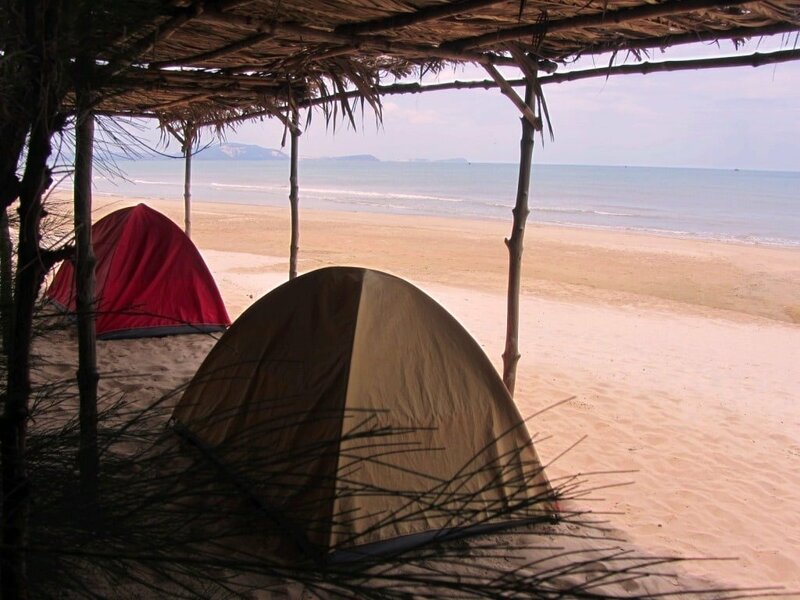 All the main destinations along the coast get pretty swamped during Tet, but the further away from main centres – like Mui Ne, Nha Trang etc – you go the better the chances that you’ll get a bit of peace and quiet 🙂 So the campsites are a pretty good option, just bear in mind that they may not be as quiet as usual. I’m sure we’ll find something along the way. Merry xmas and a happy new year Tom…!!! Thanks so much for the great writing and photos. 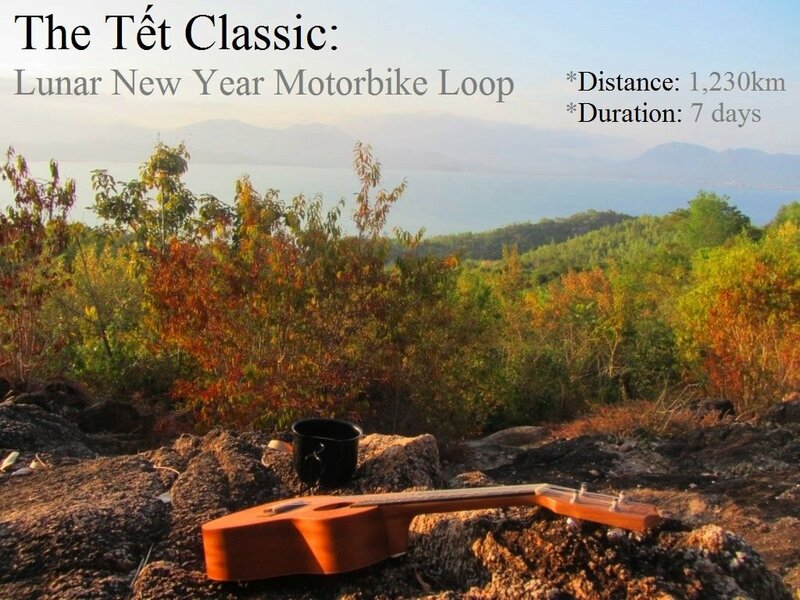 I really want to do this Tet Classic trip. Thinking maybe the Christmas New Year period. And doing it solo, for various reasons. You only briefly write on your site about your feelings touring solo or with other riders/touring partners. I would be very interested to hear more of your thoughts and feelings on doing a 7 day trip like this – solo. Thanks again for all the work documenting this. In my opinion there’s no problem doing this ride solo at all. It’s great fun on your own or with people. On your own you have the freedom to go where you want, when you want and at your own pace. But with people you have the added fun of a shared experience. But you will meet local people while riding this loop anyway. I have read some interesting places that you wrote, I hope I can meet you soon to guide you around my place. Tom I was wondering if you knew what the maintance interval was for the drive belt on a nuovo 2 scooter? I thought I remembered reading in one of your reports you know had over 100K on your bike? There great little bikes for traveling here. Thanks again for all your hard work and passing your site on to people along the way. Yes, mine has done over 120,000. But, although I love my motorbike, I’m pretty useless with mechanics: I take my Nouvo to the Yamaha garage once a year to get it checked and see what, if anything, needs changing. So I can’t answer your question. However, you could try taking it to a Yamaha garage too or a bit of searching on Google might yield some results. Thanks for the response. Was n’t sure if you had the drive belt changed in that time or not but was at a mechanic today with a friend to get a new tire for his bike and the guy spoke pretty good english and he told me I was fine at 34000k. Finding the guy that spoke some English and was honest was the key. Enjoy the New Years celebration. Good to hear you got it sorted. Happy New Year to you too! Great to read about the ocean road trip and the tet Classic. I used it as a guide on our trip to ho tram. Unfortunately we didn’t have time to travel further than that. Stayed in hoa lan hotel. Nice place with nice garden. We were there before the tet time and prices fortunately.. We were excited to visit ho tram beach resort but that was way to pricy u fortunately. we drove slowly back thru loc an town and found a nice restaurAnt which offered beach shacks and umbrella’s on the beach. Lots of wind. We were almost alone there. Fantastic chill out place. We are in Tien Giang now and wanna travel to Ha Tien next week. Supposed to be a real gem as I may believe from another article from you?! Where about are you traveling now by the way? Great to hear you enjoyed your trip along the coast. Sounds like a lot of fun. 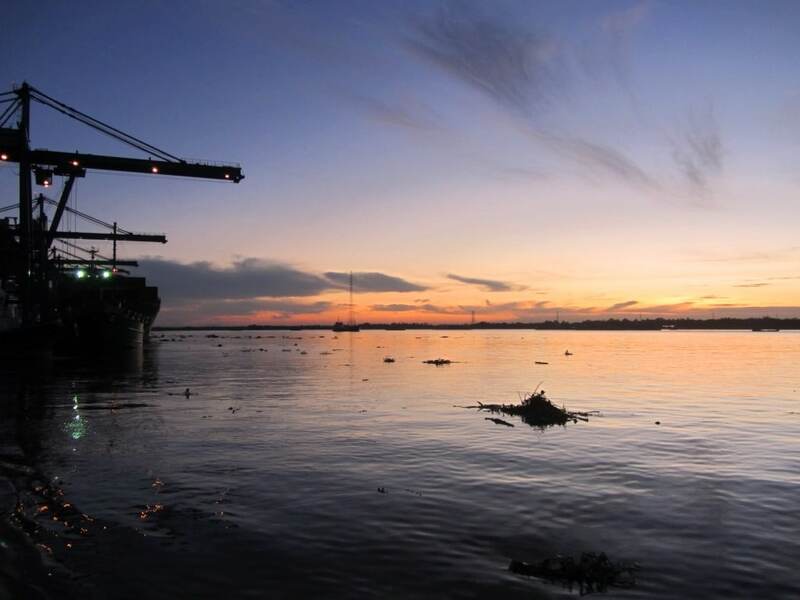 Yes, I like Ha Tien – definitely one of my favourite towns in the Mekong Delta. 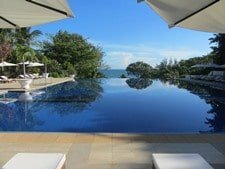 It’s going through changes now and seeing a big rise in visitors since the border crossing to Cambodia opened and the ferry services to Phu Quoc Island have become more frequent. Still a great little place. What a coincidence that you are there now! So you just started your TET trip I guess? Where will you head next? Ok so it seems to get a lot busier there. Anyway it sounds like a very interesting place to me with lots to see and do! And like it as well when its a bit lively! I will! Same to you! Chuc mung nam moi to you too! I always read your post and see that you camp a lot. How do you select places to camp and what gear do you usually bring with you? I usually pack extremely light and could bring a lot of other items to include camping gear easily. 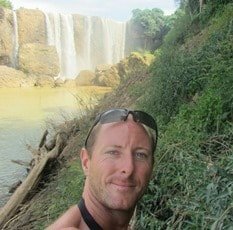 I myself go on motorbike trips all the time in Vietnam, however for me most of the trip is going as far as I can and randomly stopping at scenic places. A nice pic post of the gear laid out would be nice. You can read more about where I camp and how I camp in these Camping Guides. (Also read the comments at the end of the guides). In general, you if you are camping in the ‘wild’ (somewhere that is not an official campground) then you should be as discreet as possible, so that you do not draw too much attention to yourself. 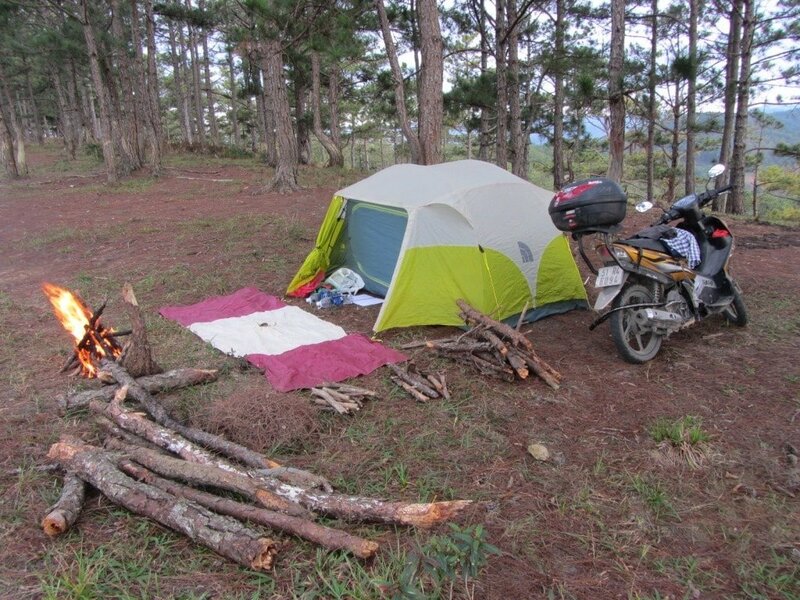 For example, make sure that no one sees you setting up camp, and that your campsite cannot be seen from the road. 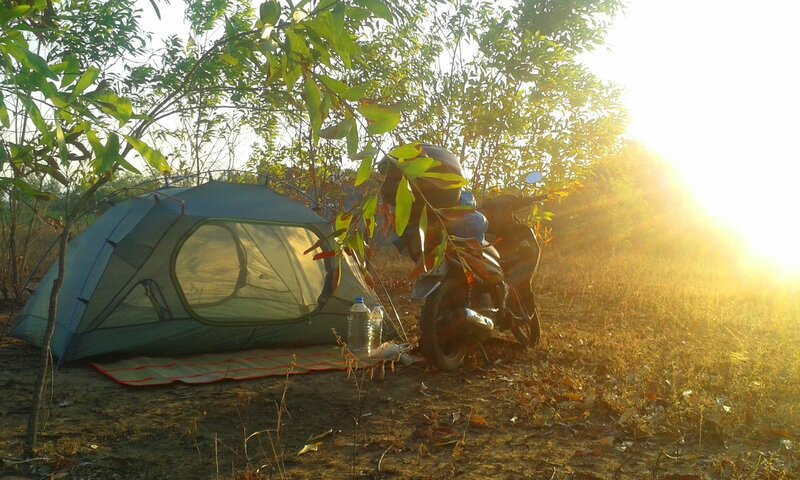 I also try to take as little as possible: a tent (or even just a hammock in the dry season), a little camp stove, some instant noodles, lots of water (you can strap a 5 litre bottle to the back of your bike), a sleeping mat and/or bag, some warm clothes (if camping in the highlands), a flashlight, a penknife, a lighter. Looks like a good way to start my trip in a couple weeks. I was wondering when you stop for breaks I take it you must always keep a close eye on year gear on the bike, Correct? Yes, sure I keep an eye of my things, but doesn’t stop me from stopping for a swim in the ocean or climbing up to a viewpoint etc. As long as you can see your stuff you should be fine. I appreciate the information.. Travel common sense rules apply. lol I travel a lot and some places are much worse then others. Looking forward to some great food next weekend in HCMC. Yes, it’s a good route to get to Cam Ranh and also into the highlands. Weather’s hot in May!